: If you were captivated by the setting of "Lost in Translation"---and who wasn't?---here's your chance to see it in person and enjoy Japan's famous beef at the same time. Slick, dark, black and dramatically lit, the New York Grill sits atop the Park Hyatt Tokyo, designed by Pritzker Prize winner Kenzo Tange. Enjoy skyscraper views like something out of anime---captivating at night---and do take a moment to admire the chefs at work in the open kitchen. Kobe beef is only the most famous grade---try others the way you might sample wine---or there's a seafood selection and some 1,600 wines. 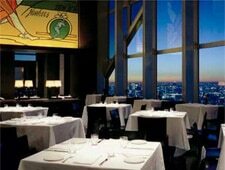 None of it comes cheap, but it's an only-in-Tokyo venue and a definite place to impress. Live jazz combos round out the experience.